It was my first time at a Star Trek convention on Saturday. It was interesting, crowded and strange. It wasn't what I expected but I have sort of warmed to it after the event. I don't know what I was expecting really. I was amazed to see so many Star Trek actors, all looked happy and were so welcoming and friendly. There were also a lot of folks dressed up in costume too, some were absolutely fabulous and must have put so much effort into achieving such a good look. My main mission was to meet two women of Star Trek that have always inspired me. The first was Nichelle Nichols (Uhura - Star Trek Original series), she paved the way for equality in Sci-Fi at a time when women were usually used as decoration. The second was Kate Mulgrew (Captain Kathryn Janeway - ST Voyager) the first female captain of a Starship. Sadly Nichelle Nichols was unwell and was unable to turn up on the Saturday that I was there, well, she is 85 years old bless her. 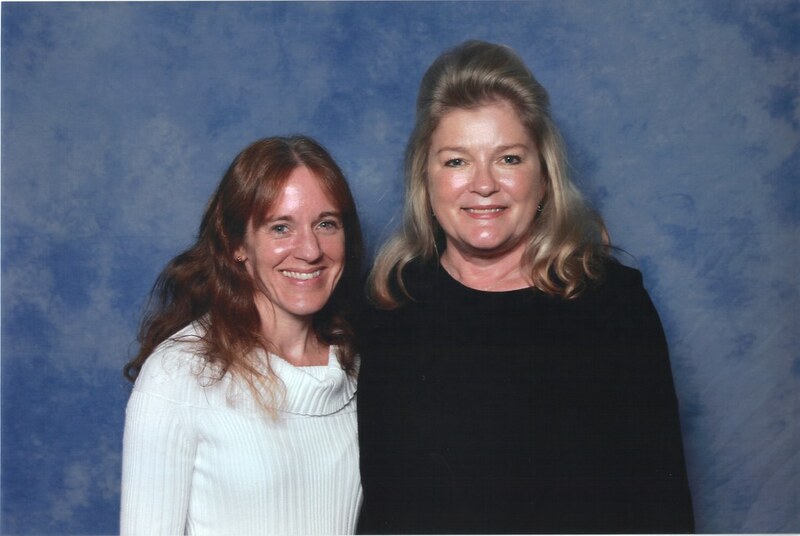 So here is my encounter with Captain Janeway, she was absolutely lovely. Finally! 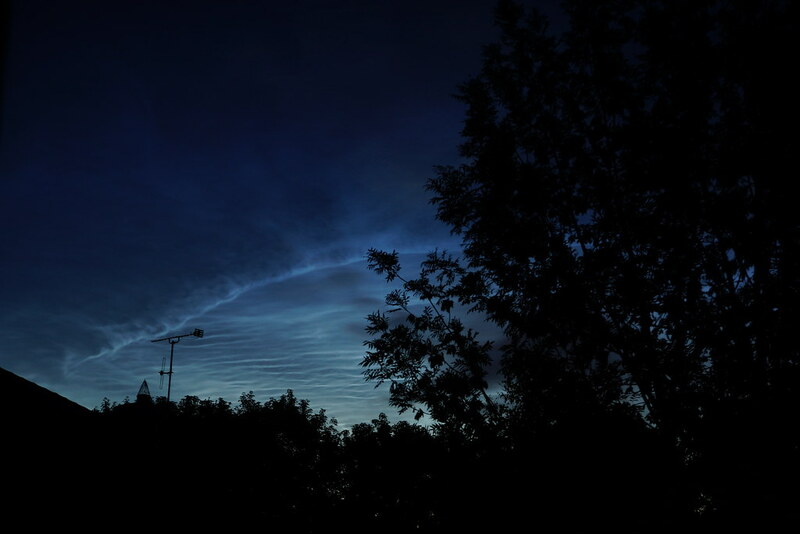 after 6 years of looking I spotted my first Noctilucent cloud display. 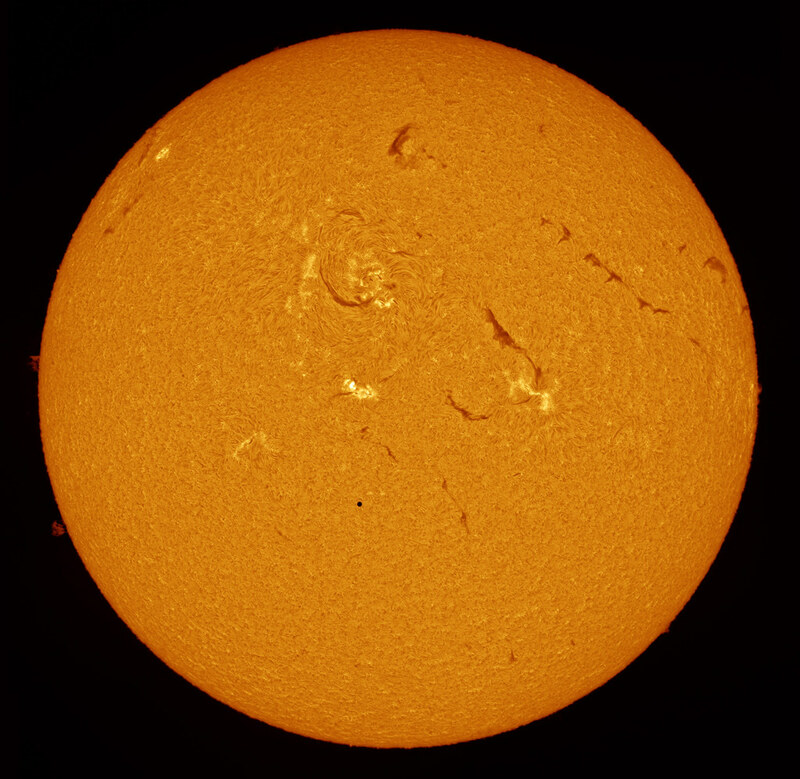 It has always been my dream to image the Sun at a much higher resolution using a large aperture telescope. 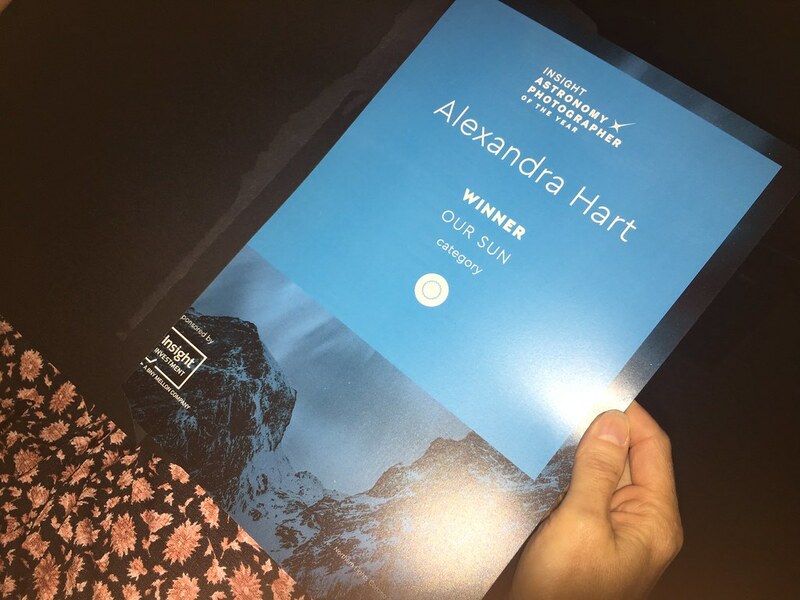 After winning the solar section of Astronomy Photographer of the Year 2017 I was lucky enough to have a fair amount of prize money to spend on this dream. It was always a consideration that my seeing conditions here in the UK under the jetstream and usual bad weather would make this unrealistic, but I thought I would give it a try as I had the money anyway. Well I did it again!! I won the Solar section top prize for the second time, but again missed out on the overall title. When you are out observing the stars in summer on lovely warm nights it is always a joy to watch the wildlife that appears around you as well. Like during the day when I am sat at my telescope it seems wildlife just ignores you as part of the garden furniture and I have even had birds virtually perch on me. During the night I have heard Owls and strange ducks or geese fly overhead and the rustle of a Hedgehog once. But most of all I love Bats, I seem to have so many in my garden fluttering around. I try not to use any pesticides in my garden as I know Bats are very sensitive. A year ago my husband bought me a heterodyne bat detector and we have thoroughly enjoyed listening and watching them but were never quite sure what species they were. We were certain we had Common Pipistrelle and Soprano Pipistrelle as we had ones at 45kHz and 55kHz and once a Brown-Long-eared bat made our garage his home for the summer. Then during BBC Springwatch this year Chris Packham demonstrated a new little device which you plug into your iPhone, it listens to the bat and auto IDs in 10 seconds! Wow! I wanted one! So after saving up my birthday money my very tiny Echo Meter Touch 2 Pro https://batdetectors.uk/emtouch arrived a few weeks ago. What fun we have had since then. Each warm evening we have sat out around sunset and watched, waited and listened. I am amazed at the variety of species that we have, it has opened our eyes and we have learned so much. I can now tell just by listening to the clicks what species of bat passes. We will start with the most common. Common Pipistrelle bat - during our one hour observations we usually get around 20-30 passing through the garden. I say passing through as they always come from a southerly direction and fly straight through the garden and head off towards the river I presume. I guess they have a roost somewhere to the south of me and always pass through at sunset towards their feeding grounds by the river. They follow exactly the same route (each bat) and do the same every night. We used to think there was a party somewhere each night that they were off to. Sometimes they stick around and loop the loop around our head, this one was recorded with a feeding buzz. As they home in on their prey their echolocation gets quicker and quicker. Sometimes we have seen the moth just drop dead (but not really dead) out of the air and fall to the floor to escape capture, so they must be able to hear the bat. You look through your telescope eyepiece and there in front of you is the most wonderful sight, you know immediately you must capture this moment forever. Not only will this give you a lasting memory of the event but also it can become an important scientific record. Many times an amateur astronomer has been the first to discover a new event but even if it isn’t a rare event it is important to you. 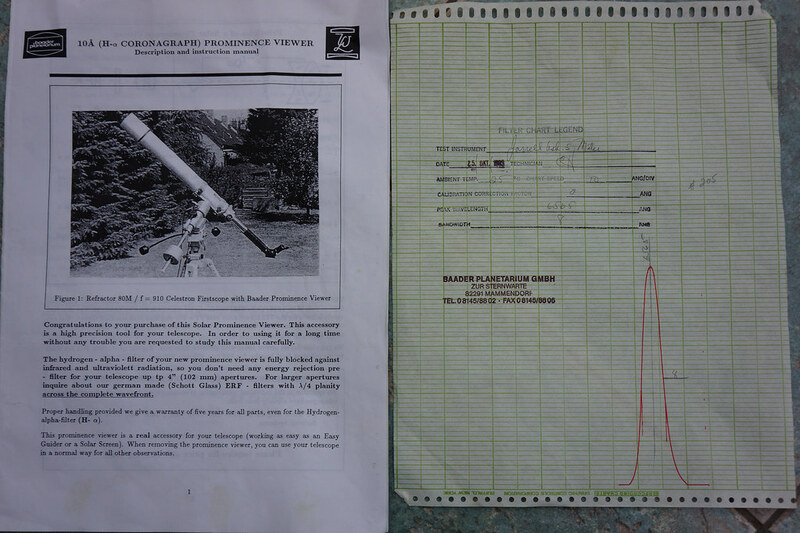 Being prepared and able to accurately record a flare or a prominence lift off for instance can be a very rewarding challenge and can become very valuable data when submitted to the various astronomical associations and data collection sites. 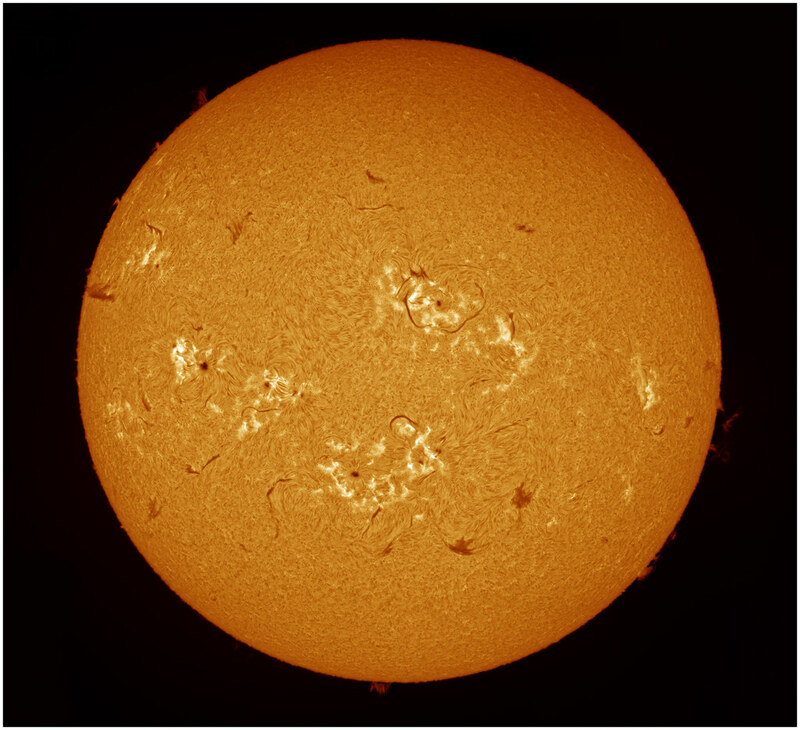 Whether you become a serious imager for data submission or just want a personal record of daily solar activity it is important to have the right equipment to hand and to be able to get the most out of it. In January an astronomy friend from Portsmouth contacted me to say that he had inherited a Baader Coronagraph from a society member. He had tried to use it but didn't understand how he could set it up with his telescope or make good use of it. He was extremely kind and offered me the Coronagraph. 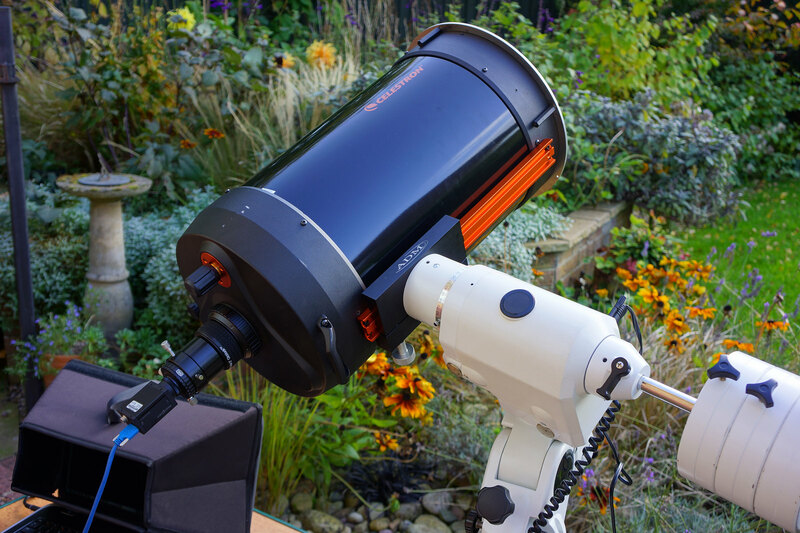 Of course I leapt at the chance to own one of these early Coronagraphs which allowed amateurs an affordable way to view the Sun for the first time in Hydrogen alpha (H alpha) and see the prominences of the Sun without the need for a total solar eclipse. The basic concept is that there is no need for a very tight <1 angstrom filter (very expensive etalon) as a regular coated band-pass filter (fairly cheap) of around 6 angstroms can be used instead and surplus bright continuum light from the solar surface is blocked by an occulting disc placed in the focal plane to form an artificial eclipse, thus allowing the astronomer a view of the prominences (just like during a real total solar eclipse). 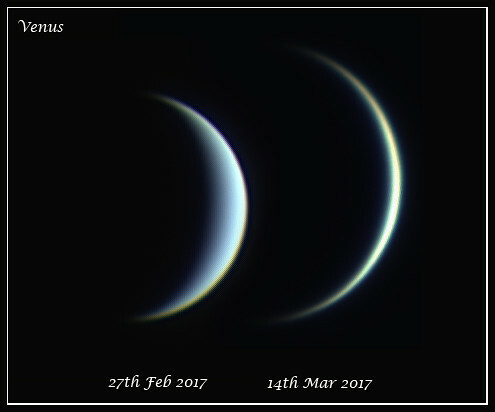 Having taken an image of Venus on 27th February the challenge was to image again before Venus comes to inferior solar conjunction. This means that Venus will pass directly between us and the Sun and so showing only its night side toward us. This conjunction takes place on 25th March 2017 so Venus is very rapidly dropping in the evening sky towards the setting Sun and getting larger in size and smaller in illumination. Here is a picture of the difference in just 2 weeks. On 27th February Venus was 0.364AU (approx. 33.9 million miles) from Earth at phase 18.401% with apparent angular diameter 45.70". 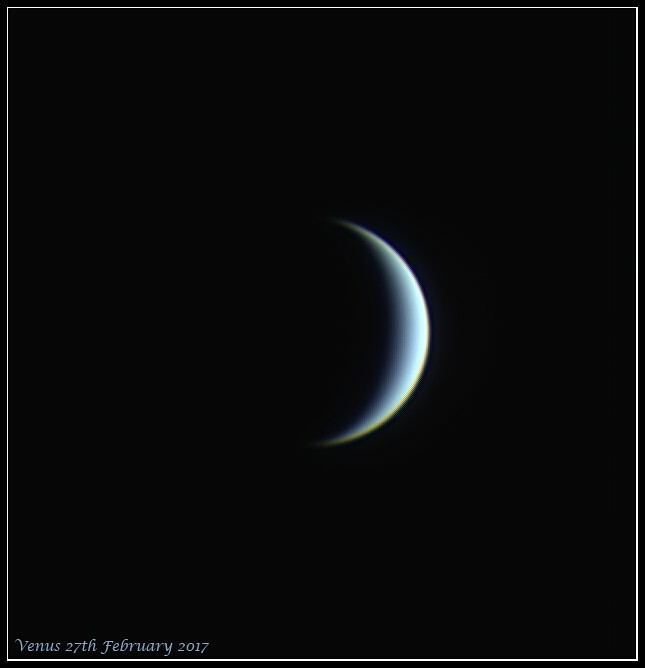 On 14th March Venus was 0.297AU (approx. 27.6 million miles) from Earth at phase 5.337% with apparent angular diameter 56.04". I don't think it will be possible to get another image as it will become too low in the sky for me to observe. If you can watch the sunset, stay out for a while afterwards and look out for Venus (a very bright star in the west), with only a small pair of binoculars you will see a lovely thin crescent, it is absolutely beautiful. But you will have to be quick to get a look before 25th March, after this date Venus will start to rise as a morning star (visible before the Sun rises). The weather this year has been terrible, I have never known such a cloudy spell for so long, I haven't seen the Sun, Moon or stars for weeks. Last night the skies cleared briefly to give just enough time to catch Venus in her beauty before she slips away over the next month. Seeing conditions were terrible but Venus was still very beautiful.